Where are you located? How many locations do you have in Ontario? Our head office is located at 2428 Islington Avenue, Units 203 and 206 in Toronto. We also have branch offices in Mississauga. Are you licensed to provide security guard and private investigations services in Ontario? Yes, we are a licensed, bonded, and insured security guard and private investigations agency. Our operating license is clearly displayed at our offices. What is uniquely different about your company that separates you from the rest? Our company is the first and only company to showcase and utilize advanced technologies currently incorporated in today’s police and military forces. Police and military forces have advanced exponentially, yet the security industry has remained static for decades. Our security agency is the only firm that moves forward with technology to better serve our clients and to keep our men and women safer than ever. Others claim to keep up with technology and revolutionize how security is conducted only to equip their guards with a pen and flashlight. Our guards on the other hand will clearly demonstrate the innovations we have to offer to better our tactics and serve our customer smarter, faster, more efficient, and most of all, safer than ever. Some of the technologies we incorporate are infrared, photoelectric, and RF sensor technology. How do you ensure accurate reports and good conduct from your security guards? Interforce International Security and Investigations is one of the fewest security guard companies that utilize electronic report writing using company issued computers. And since every company issued computer can be remotely viewed by our management, we can instantly view every security guard’s report in real time, critique their reports, and even engage in video conferencing with our security guards to ensure that they are in compliance with company and client protocols. Video telephony is used to perform “virtual spot checks.” Their attire, reports, and site specific matters can easily be addressed immediately by two way video telephony. We also will equip all of our security guards with a guard scanner tool, which records the security guard’s patrol route by scanning various checkpoints set by our technicians throughout your property. The time, date, and location will be recorded. This ensures that a consistent patrol of your property can be verified. We can put NFC tags in as much areas as deemed necessary. In late 2014, all of our manual guard scanner devices will be upgraded to real time, allowing our management staff to view a security guard’s patrol history in real time from any computer instead of manually downloading data. Customer satisfaction is high on our priority list, always ensuring that everyone is satisfied and happy with our services. Last but certainly not least, we utilize GPS to verify a security guard’s exact location for locations that are remote and require a security guard to sign in, sign out, and check in periodically. MLEO (Metro Law Enforcement Officer) contracted by your municipality. Emergency first aid level C.
Last but not least, customer satisfaction! What do you do to ensure all of your security guards are up to date on training? Interforce International Security and Investigations has a comprehensive training matrix for all of its employees. They are often given refresher courses every six months to ensure that their skills and expertise are up to date. Tests are given out and are stored in the respective files for reference. Memorandums are issued to each security guard once a new development is implemented. Strict protocols are issued to each security guard in the event of a fire, natural disaster, bomb threat, or terrorist threat to prevent and/or minimize property damage and civilian injuries. We also provide our security guards refresher courses for first aid, CPR, and AED defibrillator use. This training is free of charge for our employees. 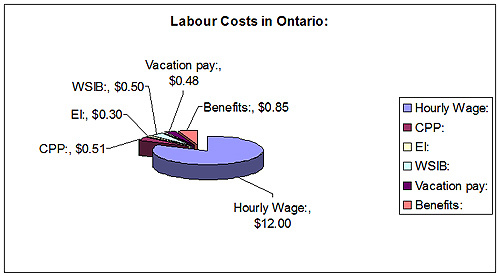 As you can see from the chart above, the total labour costs associated with hiring a security guard in the Province of Ontario (based on an hourly wage rate of $12.00 per hour) without any company profit is $14.64 per hour. This does not include company overhead costs. Company profit and overhead costs is added on top of the labour costs which translates to your hourly billable rate. Workplace safety and insurance board (WSIB) is a premium all employees have to pay and is mandated by law in the Province of Ontario. This premium covers all workers and provides injury benefits to workers who are injured on the job. The rate an employer is required to pay for WSIB is $0.50 for every hour of labour performed. For more information about WSIB, please go to http://www.wsib.on.ca. The Canada Pension Plan (CPP) Retirement Pension provides a monthly taxable benefit to retired contributors. All employers in Ontario are mandated to contribute to this plan for all of their employees. The rate an employer is required to pay for CPP is $0.51 for every hour of labour performed. For more information about CPP, please visit http://www.servicecanada.gc.ca. Employment Insurance (EI) provides temporary financial assistance to unemployed Canadians who have lost their job through no fault of their own, while they look for work or upgrade their skills. Canadians who are sick, pregnant, or caring for a newborn or adopted child, as well as those who must care for a family member who is seriously ill with a significant risk of death, may also be assisted by Employment Insurance. The rate an employer is required to pay for WSIB is $0.30 for every hour of labour performed. For more information about employment insurance, please visit http://www.servicecanada.gc.ca. Health, dental, and life benefits are supplementary benefits provided to all of our employees. These benefits are not mandated by the Province of Ontario, however, Interforce International understands that health and dental benefits are crucial for long term employee retention. Employee moral is much higher, and our security guards have more pride in their work considering that they are well cared for. Our rate for health and dental benefits are $0.85 per hour of labour performed, which includes health, dental, and life coverage. Beware of shady companies offering security services which are lower than the minimum labour cost illustrated above. They do exist! In fact, one of our direct competitors is offering new clients a service rate well below the minimum labour rate, resulting in operating at a loss, or cutting corners by avoiding CPP, EI, and/or WSIB payments which is required by Canada Revenue Agency. Dealing with such companies like that can result in high liability, poor employee retention, terrible customer service, and quite possibly services that are not adhering to law. Interforce International will always guarantee all clients that they are getting the most value for their money at competitive prices. Because our operating costs are lower than the larger corporations, we are able to offer significant savings when dealing with us with higher value. What are your methods for retaining employees on a long term basis? Before we answer that question, our management staff (whom have all been security guards in the past for years and know the industry inside out) recognize that the number one complaint that all clients have is constantly dealing with new security guards that are assigned to their property, or high turnover of security staff for their property. One client complained that he would have to retrain security guards every week due to the high turn over of guards who worked for him. This required a lot of resources and time, and demonstrates poor relations with a security agency and their employees. Interforce International’s main goal is to provide all of our clients with permanent employees who plan to work with us long term. Along with an excellent employee recognition program, our company does compensate our guards at a higher rate of pay in comparison to the competition. This attracts skilled workers and retains them long term. By paying security guards minimum wage, one can expect devastating consequences in terms of finding employees to work for such company, employee turnover, and the loss of contracts. In fact, one security agency did suffer from that fate. How long has Interforce International been in business, and experience do they have? Interforce International Security and Investigations has been in operation since 2006. We currently serve several key service agreements at warehouses, construction firms, retail stores, apartment buildings, condominiums, automotive dealerships, and currently have the rights to provide security for a shopping mall in early 2016. We are one of only a few security agencies in Ontario that offers perimeter security for construction firms, so it makes sense to deal with Interforce International. More importantly, our senior management staff have all been employed as security and concierge guards in the past for years before making the transition into management. The experience that our management staff have is extremely beneficial because we know the industry inside out: From a security guard and client’s perspective to a management’s perspective. What is your position on customer satisfaction? Our goal is to provide all of our clients with first class service in protection and hospitality. All of our men and women have received special customer satisfaction training to ensure that your business of community is always cared for. Our feedback system is second to none. Not only do we provide every customer with a dedicated telephone number to report how we are doing, we also provide a dedicated e-mail and mailbox fully equipped with forms. Should we receive negative feedback, no matter how big or small, we are committed to fully investigating every complaint and issue a resolution within 48 hours. Sure, we’re not perfect, and no one is. Complaints are expected to be issued against us from time to time. Our goal is to learn from our mistakes and ensure that they do not happen again. All feedback will be reported to our customers on a bi-weekly basis in the computerized report that we issue you. Do you offer security guard training for individuals interested in pursuing a security career? Yes we do! We are a licensed security agency and registered with SERCO Ontario to provide the 40 hour mandatory basic security guard training course, which is recognized by the Private Security and Investigative Services Act. We also provide in house certification for emergency first aid & CPR, as well as weapons training. Visit our training page for more information. Why should I choose Interforce International Security and Investigations instead of some other security or private investigations agency? There are many reasons why we stand out in front of the competition, and we have outlined many of the reasons at our “why choose Interforce International” web page. Do What areas do you serve? We serve anyone who requires security protection that is within 500 kilometers of the city of Toronto.